It’s Wine and Unwind time! Now that “Hamilton” is up and running and only rehearsing 12 hours a week (in addition to an eight-show a week performance schedule) James has time to bake again. Ahem. It’s also gluten-free, so you can serve it to just about anyone. A useful recipe to have in your repertoire in this day and age, no? 1. Preheat oven to 350°F. Using a 9-inch tart pan with removable bottom, spray with nonstick cooking spray. 2. In food processor with knife blade attached, pulse macaroons until fine crumbs form. Pour crumbs into prepared pan and press crumbs onto bottom and up side of pan. Bake crust 10 minutes or until golden-brown; cool completely on wire rack (about 30 minutes). 3. In 1-quart saucepan, heat 3/4 cup cream to boiling on medium. Remove from heat. Add chocolate; with wire whisk, whisk until melted and smooth. Stir in liqueur and vanilla. 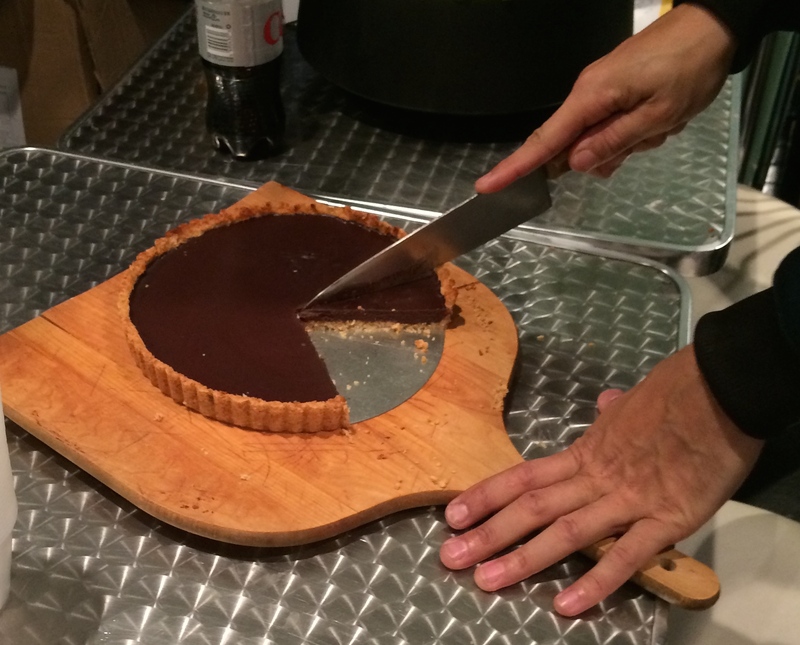 Pour chocolate mixture into tart shell. Refrigerate 2 hours or until set. 4. When ready to serve, in small bowl, combine sugar and remaining cream. With electric mixer on medium speed, beat cream until soft peaks form. With vegetable peeler, from orange, remove strips of peel measuring approximately 3″ by 1/2″. With paring knife, scrape off and discard white pith from peel; very thinly slice peel lengthwise. One at a time, wrap each strip around chopstick or pencil and hold 10 to 15 seconds or until curled. Garnish tart with whipped cream and citrus curls. 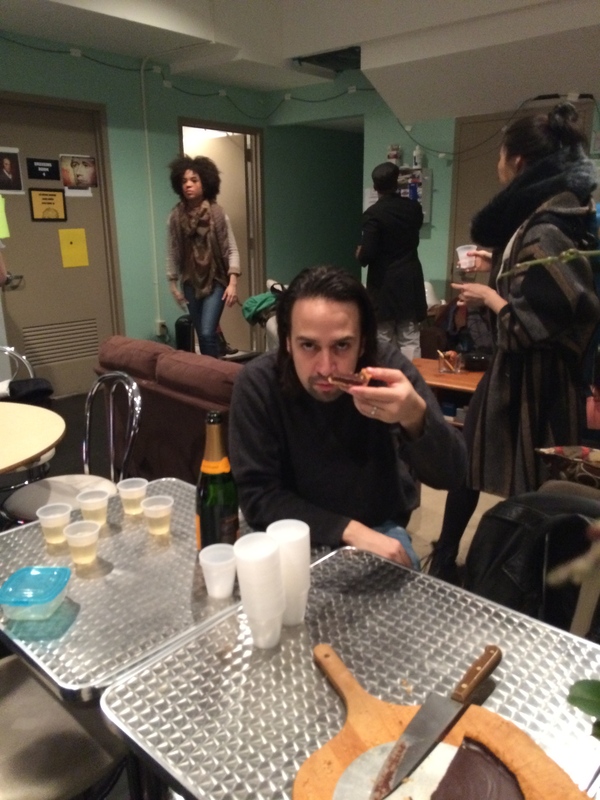 Lin-Manuel Miranda taking his tart very seriously. Sidney Harcourt, a member of the Hamilton ensemble, digging in. The glamor of theater! 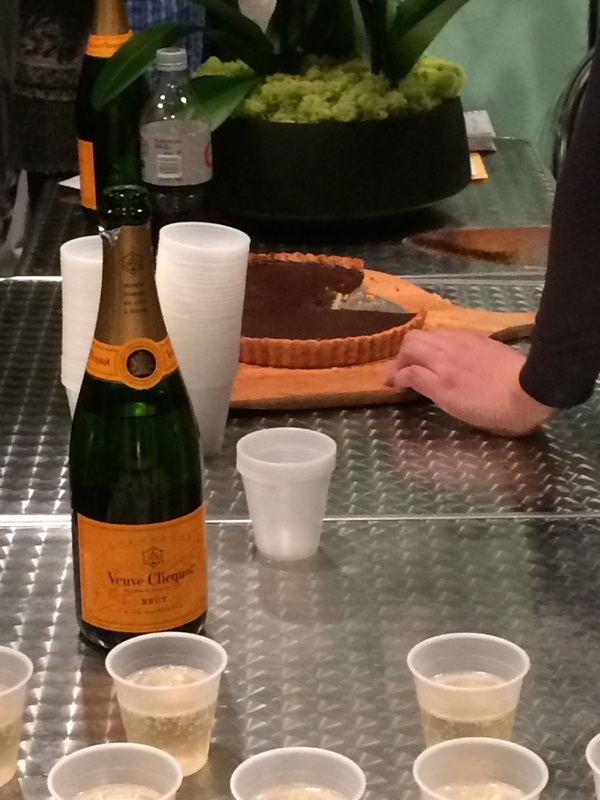 Thanks Anna Wintour for the Veuve Cliquot! !